It’s dark, it’s cold, and I'm stepping on a narrow ridge with just my head torch and a rope attached to my guide to lead the way. We are about 4300 metres above sea level with another 500 metres of vertical gain to go. Calories from the 2am breakfast that I forced down is waning with each step. But the altitude is starting to have an effect; the thought of trying to eat something is making me feel very nauseous. Thoughts of fear of the descent start to creep in. This is hard, mentally and physically...and I wouldn’t have it any other way. I have only ever lived in cities in the U.K. - currently London. To the confusion of my lovely mum, I always wanted to be outside - especially when it was raining! I love the outdoors, the mountains, the oceans and doing anything physically active. So after a very tough year, I knew I needed to change some things and started thinking about what I wanted from life. I quit my job, booked some adventures and enrolled myself into working a ski season. 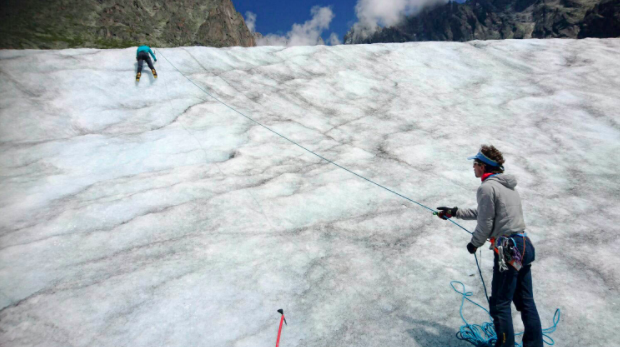 First-up was a mountaineering course based in Chamonix, France. 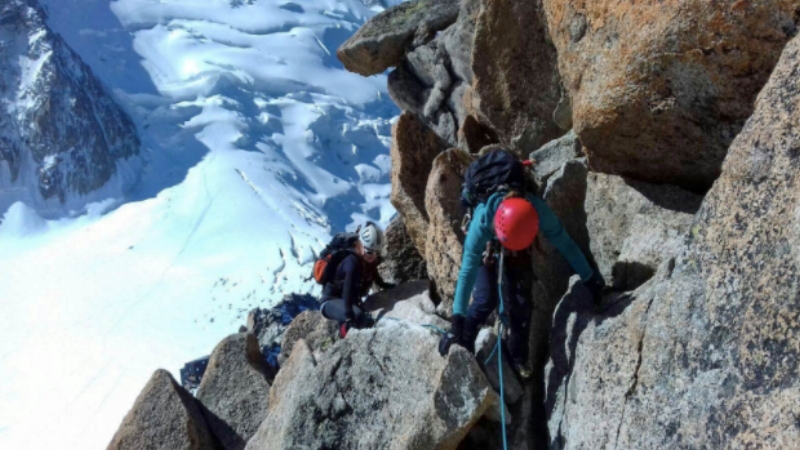 I booked onto a 1-week introduction to alpine mountaineering, followed by a 1-week ‘Mont Blanc’ course. French practised (badly) and lift pass purchased for the two weeks, we were off to the Aiguilles Rouges (red peaks) for a hike/scramble. The cloud lifted to reveal the stunning Mont Blanc Massif opposite us, bathed in bright sunshine but still looking intimidating. Initially, I felt like Bigfoot but I soon got used to my rental B3 mountaineering boots and started to feel more mountain goat-like (sort of...) After an evening session on tying knots, we headed to bed full of enthusiasm and slightly sunburnt faces - very English! That was where the good weather ended. Enter ‘character building’ fun. The following two days were spent on the glaciers, getting used to using all the gear, crampons (high heels), ice axe, harness etc. "Bambi on ice" is how I can describe my initial ability to walk in my high heels. I also learnt how to traverse, climb and descent steep ice. I was doing my best to remain positive (it is really all you can do to make the most of a situation!) but I couldn’t help but feel unconfident and like the only person in my group not getting it. Suggesting my crampons were a little blunt (they really were) the company supplied me with a set of new, really sharp crampons - here’s hoping I thought! Next up? Over the border to Italy to attempt Gran Paradiso (4000 metres). Whilst the clouds added incredible atmosphere to the surrounding lush green valley up to the bare rocks and snow-capped peaks, it came with a sense of foreboding; that the mountains were not playing ball. After a night of rain hammering on the mountain hut roof, later giving way to snow, the mountains had decided not to be climbed that day. Respect given. New roomie, new people to meet, and new weather - sunshine! Back to the glacier but in new crampons, I could finally get the footwork down and got back to feeling more like a mountain goat! The following day was spent climbing the Cosmiques Arete. This day gave me a further confidence boost on a slightly more technical route, our guide Filippo was awesome (as are all the mountain guides, thank you) and I was getting into the swing of mountain life. Before I knew it, we were on our way to Mont Blanc. After taking the Tramway du Mont Blanc, we then hiked/climbed for about 4 hours to reach the Gouter Hut, the mountain refuge at 3800 metres that looks more like a spaceship and would be home for the next 12 or so hours. Rising at 1:45 am with me fellow bleary-eyed climbers, I forced some food down at 2 am, geared up and was ready to go. We had three kilometres to the top with a 1000 metre elevation gain; hard work in the thin air! There was only snow up here, glistening in the light of the head torch. We could only hear our own breathing and footsteps. We were consumed by the mountain, giving her 100% concentration... but in a very brief moment of taking my eyes off my feet, I saw the sun slowly rising on the purple, blue and orange horizon. Having not slept at all in the hut, I felt very tired, and the altitude meant I couldn’t face eating on the way up. All I could manage was this rhythm of one foot forward, crampons in, ice axe buried, repeat. As the ground got very steep, I had a moment of self doubt, but this is when I realised my body is a lot stronger than I thought and it’s only my mind that I had to convince. So on we went. Finally, I stood on the summit. But after 5 minutes, I realised "I'm only halfway there" and it was time to go! It was a long 2500 m descent back down, and I have black toenails as a reminder. 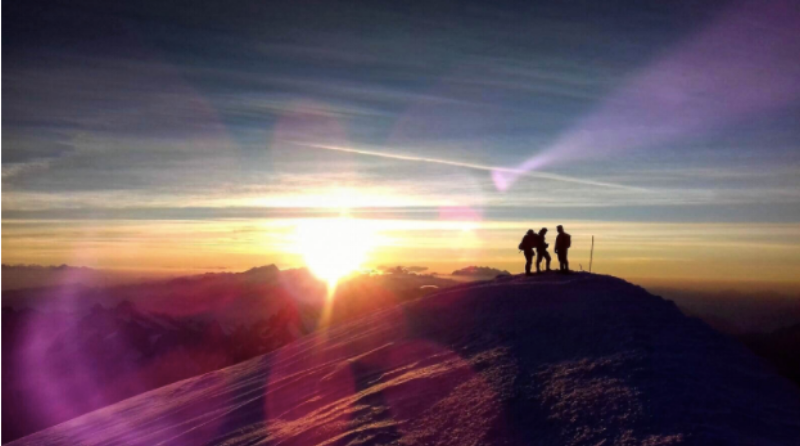 Mont Blanc, or any other personal goal is not about ticking a box to earn bragging rights. The journey there is so much more important, whatever the outcome. For me, climbing offered a level of introspection hard to come by otherwise.